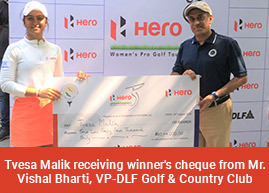 Hyderabad, August 23: Two early birdies and then another in the closing stages helped overnight leader Amandeep Drall keep her lead in the second round of the 12th Leg of the Hero Women’s Pro Golf Tour on Thursday. Amandeep, who began the second day with a three-shot lead, is now 3-over 145 for 36 holes and still ahead by two shots over second placed Sonam Chugh, who carded 73 after her first round of 74 to be sole second at 5-over 147 at the Hyderabad Golf Club. Amandeep will need to ensure she does not drop any early shots and allow Sonam and Tvesa to get any closer, or else it will be a tense battle in the final round. Amandeep, who has been on a good run with three wins in the last four starts, birdied second and third to increase her overnight lead. A triple bogey on the Par-3 fourth wiped away Thursday’s gains, and she bogeyed again on the Par-5 seventh and Par-4 10th. Yet another bogey on the Par-4 16th meant she was 4-over for the day, before a late birdie on the Par-4 17th gave her some respite. Sonam double bogeyed the Par-3 fourth and turned in 2-over 37, but again suffered a double on the Par-4 10th. Birdies on 11th and 18thsalvaged the round for her as she finished at 73, the day’s best score. Amateur Sneha Singh (74) had a fine front nine with one birdie and no bogeys, but she had three bogeys, a double bogey and just one birdie on back nine for a second half of 4-over 40 and a card of 74. Suchitra Ramesh (75) is tied with Sneha Singh for 4th place, while Millie Saroha (76) is sixth. In the final round, Khushi Khanijau and Afshan Fatima will start proceedings in the first two-ball, followed by Ayesha Kapur and Siddhi Kapoor. Millie Saroha, Suchitra Ramesh and amateur Sneha Singh will comprise the penultimate group, while Tvesa Malik, Sonam Chugh and Amandeep Drall will tee off last in the leader group.